The Amazon Rainforest is immense (it's larger than Europe). The 6280 kilometer (3900 mile) long Amazon River is fed by a thousand rivers - some over 1600 kilometers (1000 miles) long. 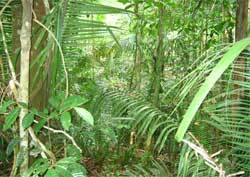 Broadly defined, the Amazon Rainforest extends into nine South American countries. Nearly two-thirds are in Brazil. Peru is the runner-up. Click Brazil and Peru for my wonder guides on those two countries. The Amazon's two major gateway airports are in Manaus (Brazil) and Iquitos (Peru). On my first trip to the Amazon, I quickly discovered that road trips are severely limited because the jungle is thick and dissected by numerous snaking rivers. Watercraft and occasionally small airplanes are the most effective means of transportation. The view from the deck of a passenger ship becomes monotonous. You get a bored dèjá vu feeling as the river and its banks remain virtually unchanged for days on end. And, the dense riverside greenery hides nearly all the wildlife you came to see. The better Amazon cruises explore the Amazon tributaries and offer interesting land excursions. Which is better, Manaus or Iquitos?